Oh, pardon us. We don't actually get to decide when everyone can board the train. And come to think of it, there probably aren't any trains close by... But wherever the nearest train station may be, we're pretty sure they'll need someone to make sure those thundering steam engines are in tip top shape and on schedule! It sounds like the perfect job for your little fan of the hit children's show Thomas & Friends! 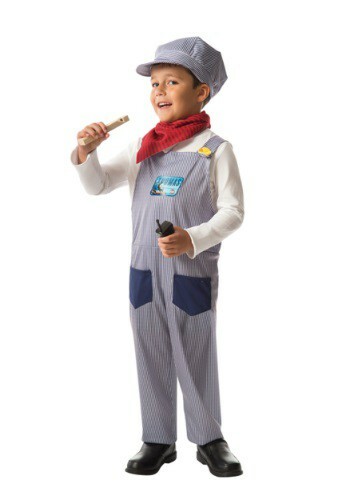 Your kid probably knows the basics of imaginary train engineering and scheduling from watching the show, so this official Thomas and Friends Conductor Accessory Dress Up Kit will let them put their skills to the test! This kit comes with an adorable striped conductor cap and a red kerchief. (to wipe soot off of their face when checking the imaginary boilers) And no conductor should be without a train whistle, like the included one that's made of real wood! They'll have a blast playing with their toy trains while wearing these fun accessories; but don't wait too long, there's a schedule to keep!